Rob Roman Trio's repertoire is diverse and appeals to those who appreciate jazz, classic R&B, as well as soulful rock, pop, and funk. 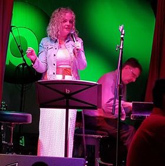 Their jazz repertoire , sung by Doreen Comerford Roman , draws from the Great American Songbook and their repertoire includes songs that were popularized by artists like Ray Charles, Roberta Flack, Aretha Franklin, Gladys Knight, Stevie Wonder, and Billy Joel. Join them tonight in the Hawkeye Grill from 9 pm til midnight.